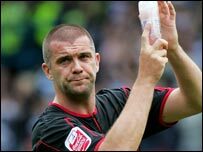 Stoke City have told club captain Dominic Matteo he is free to leave the Britannia Stadium after deciding not to offer him a new contract. The former Liverpool, Leeds and Blackburn defender joined the Potters in January 2007. Matteo, 34, has played six times for Scotland and made 24 appearances for City, scoring one goal. Goalkeeper Russell Hoult, defender Marlon Broomes and youngster Adam Garrett have also been released. Potters boss Tony Pulis insists he will not rush into making signings. He told BBC Radio Stoke: "The chairman made money available last year and wanted us to get things done, but the players weren't there at the time. "I'll always put the club first. I know I've failed with some deals but the majority of deals I've done have been in the best interests of the club." The Potters manager is also well aware that the money promotion to the Premier League has brought will make his club an attractive target for agents. He said: "Where there's money there's agents. It's important to be careful and to sift through everything that is thrown at you. "I'd like to get that little bit of quality in as well as the players I feel that fit what this club needs."